I’m 46 years old and I think I want to be Lucille Mulhall. 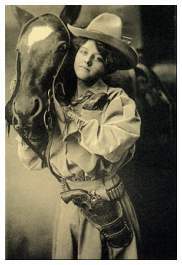 Mulhall was (summarizing from the Oklahoma historical society and other Wikis) a “petite and genuine woman with a demure demeanor who could out shoot most all the men in the wild west shows and competitions.” Well, I’d like to be petite! And demure!… And, she was an Okie. This blog entry is about how I learned about Lucille Mulhall, how I got attached to a restaurant and small rural town named for her family, how the restaurant burned down and how I said goodbye. If you take away the fact that I love Woody Guthrie music, that I work at OSU and both my husband and I are alumnas, and the fact that I’m a dyed-in-the-dirt red blooded Okie, I might never have come to learn about Lucille Mulhall. But I am all of those, and so I did. “Lucille’s Restaurant” had become a local hang-out for many-an-alumnus and was operated by OSU alums as well. Only 20 miles west of the university, it began to serve a growing population of football fans after the games, groups of weekend bikers (you’re met with a “Bikers Welcome” sign as soon as you pull up to the parking lot), and even began to get write ups and reviews in the larger newspapers and blogs. About three years ago, it moved to the top of the list as one of the Oklahoma’s “destination restaurants” and was listed in several publications as “One of the top 5.” Around this same time, I read about the owners in an OSU publicity piece and asked Mick to drive up and meet me there after work one day. He did, we enjoyed it, and it became one of our special places to go as well. (Pictured here: Lucille’s, before the fire, 2008). 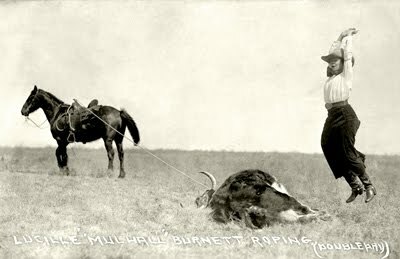 Lucille’s restaurant was named after Lucille Mulhall, and was located in Mulhall, Oklahoma – named after her father’s family who owned a 75,000 acre ranch and worked with the cattle owners running their livestock from Texas to Kansas City. I suppose I should write “is” located there as the original portion of the building is still standing. I drove by there last night on my way home because I was having a hard time letting it go. The restaurant was struck by lightening in the fall of 2009 and the last video I could find online quotes the owner as saying, “We’re going to try and rebuild. We’ll just have to see what it will take.” And although the sign hanging on the window says, “Will open under new management Fall, 2010,” nothing has been done since the clean up after the fire to indicate progress. I know this because I personally inspected it – I looked for any sign of life or hope yesterday, and found only an empty building with covered windows and a secured front door. At this point I think I’ll interject a series of “You know you’re in Rural Oklahoma when…” comments with pictures for back-up I took along my journey. I’m invoking the “I AM from rural Oklahoma so I CAN make this commentary” rule. Some aren’t funny, and some are (in my head anyway). Here we go…. 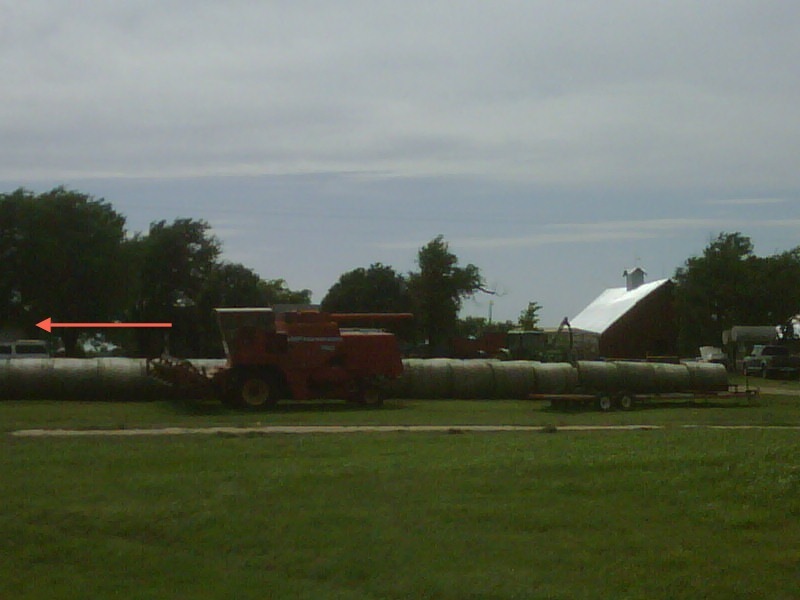 YOU KNOW YOU’RE IN RURAL OKLAHOMA WHEN…. The back roads taken to Mulhall have patches on their patches that were patched. I blame the recession. When…the front lawn hard scape (aka: yard art) for the locals consists of tractors and big rolls of hay. The arrow inserted is pointing to the front of the house. When the parking lot of the local quick store on the corner is populated with cars, trucks, motorcyles AND tractors loading hay onto pallets for feeding. 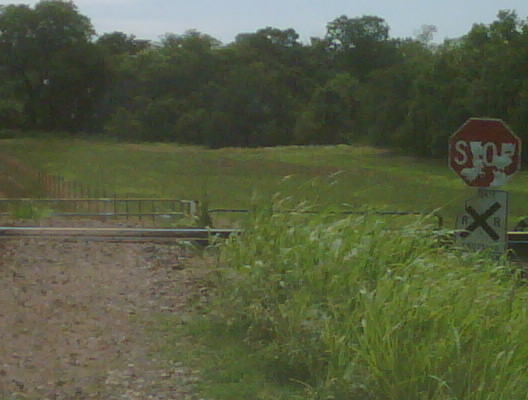 When the city administration is kind enough to purchase both a stop sign and a railroad crossing sign for the ONE farmer who crosses these tracks en route to his property. When the urban graffiti consists of matching his and hers happy faces on the water and fuel tanks for the tractors. When the town school is in a cooperative agreement with the “Fair Barn” and is comprised a good percentage of livestock gates and trailers. When you see fences built by farmers or ranchers that are stronger than the multi-ton red rock boulders that get washed down the hill and slam into them during last week’s flood. 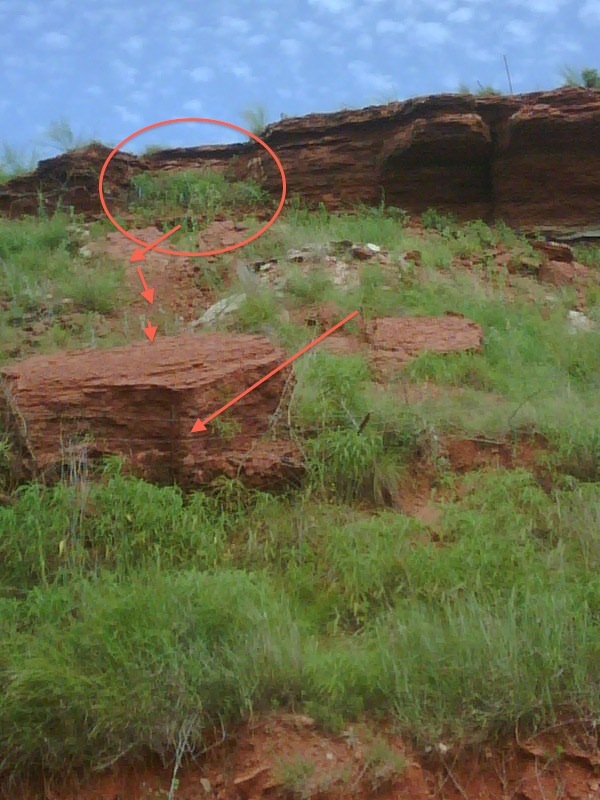 The arrows show the fence post still holding the boulder, and the basic trajectory of the boulder slide. That fence is Oklahoma tough! We later saw a sign in town that read Population – 239. These photographs and others were in every dining room in the restaurant; larger than life, conjuring up images for the guests of Lucille competing against the men, roping and wrestling down calves, racing her horse and winning marksmanship (marks-woman-ship) competitions. But this visual is what sobered my mood…the wind was blowing, but that was the only sound I heard while thinking about the business that used to visit this place. The shot is pixelated because I had my cell phone camera settings incorrectly adjusted. Sorry for the image, but it conveys my blurry mood a bit – so I’m okay with that. I drove past the building and parked at the corner. Across the street was a vacated building with a banner hanging inside. The art on the banner included “Lucille’s Ice House,” “Lucille’s Restaurant,” and “Lucille’s…(something. 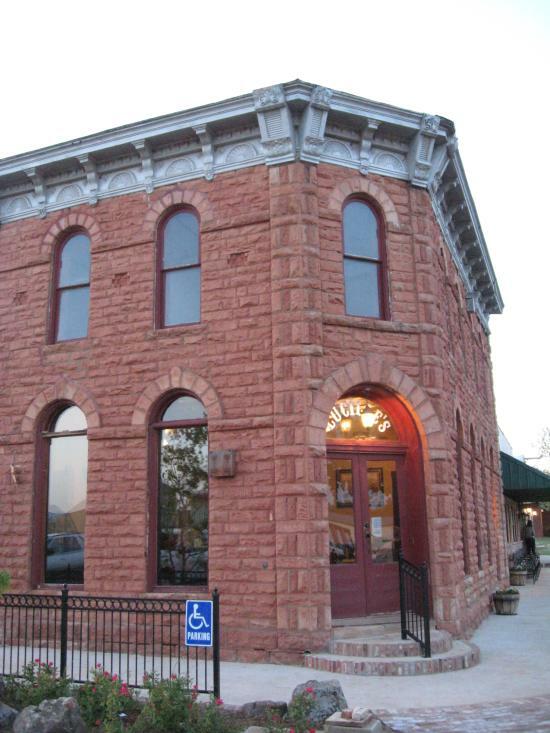 )” There were three separate buildings in the town that had at some point had her namesake? I’m not sure. But I do know there are now none. I was staring at this banner through the window trying to make out all the images and themes the town had wished to show the public when the local train blasted it’s horn as it passed through town. I was so deep in thought and the train whistle was so loud that both my feet moved while my body jolted in surprise. Then, of course, I looked around to see who might have gotten to witness that little comic moment. The train whistle had all the energy that I had assigned to the image of Lucille Mulhall in my mind, and it jerked me out of my melancholic thoughts. I rounded the corner and watched the powerful train roll by, pulling car after car for a good three or four minutes. The ground shook and rumbled. I thought, “When Lucille was racing her horses against those cowboys, I’ll bet the ground shook and rumbled.” I felt like crying, and felt like riding a horse at full speed along side the train at the same time. I went back to my car (my horse) and got in. As I sat there, not yet quite ready to pull out of town, I came to a few conclusions. I think I’ve attached myself to Lucille Mulhall because she wouldn’t put up with “the glass ceiling.” Rather than waiting on Hillary Clinton to give her speech about the 18 million cracks the people’s votes made during the 2008 election, Lucille would have just pulled out her pistol and shot the damn glass. I started my “horse,” and rode out of town. If Lucille can’t be remembered with her restaurant namesake any more that’s just fine. I’ll just be her. I AM Lucille Mulhall, by golly… hear me ROAR! This is a picture of my horse, parked by Lucille’s in downtown Mulhall. U all come back now, ya hear? So I came across this post while I was researching names on my family tree. Lucille was my grandmothers great aunt. I really appreciate the post and I like that other people are as fascinated with her as I am. If you have any access to any reports or documents about her that are not from wikipedia I would love to see them. Thank you. Hi, Dana – what a COOl family branch to have on your tree! I would think the best place to get any reports or other research would be:1) The Oklahoma Historical Society; or, 2) the Oklahoma State University Oklahoma History Project. The Oklahoma Historical Society has archives and great resources, but it can be challenging to navigate. You could set up an appointment if they have stuff, and then go there in person to look through their documents. The OSU library has a student’s Thesis on Lucille Mulhall. You might check it out. Sharrie – wow, how cool. I WILL check that out…and really appreciate the tip. Thanks! Great story about Lucille Mulhall…enjoyed it!